The Trinidad Robustos Extra is a refined and complex light-medium bodied Dobles, 6.1” (155mm) long, of 50 ring gauge, and comes in a 12 cigars box. Due to its short format and its smaller ring gauge, the Trinidad Reyes might feel harsher than other Trinidad vitolas, but it is definitely from the same brand as the flavors are typical Trinidad. A 2004 release. 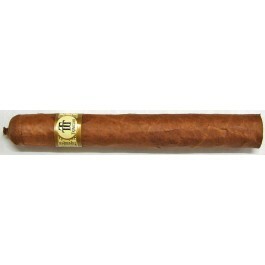 The biggest cigar of the 3 new Trinidad format. This is considered as a star cigar. Much like the Fundadores, they impress with their elegance and finesse rather than pure power. This is a cigar for someone looking for flavor and complexity. A Masterpiece Cuban cigar made to reveal the superiority of the Trinidad brand. Semi Boite Nature Box of 12 cigars. Deep and round smoke releasing all what a good "tabaco" can provide. At last a spicy Trinidad! Ce gabarit de cañonazo à perilla montada (pig tail) délivre les aromes du Fundadores, l'emblème de Trinidad, mais dans un volume qui ne peut qu'émerveiller par l'abondance. De fait, les arômes jouent dans le registre de ce que le plus belles ligadas cubaines peuvent délivrer. Vraiment dommage que cette vitole soit interrompue.